This mission is going to be very good press for the service. Anything that convinces the government to buy us our new ships is a good thing I suppose. Royal Navy’s HMS Bulwark and three Merlin helicopters are now ready to operate in the Mediterranean, working closely with the Italian Navy, and coordinated via Rome. The 19,000 tonne amphibious ship will work in tandem with the surveillance helicopters to provide a wide ranging search and rescue capability. The aircraft, from Royal Naval Air Station Culdrose, are currently stationed at the Naval Air Station Sigonella, Sicily, to be called upon when needed by the Italian coastguard. Supported by over 80 UK personnel, including air and ground crew, they have commenced their first training sortie, to familiarise themselves with the area. From today, Tuesday, they will begin flying operations with HMS Bulwark. It seems the Irish government were sorting out the same legalities as the UK before they would release the ship they announced to the effort. i must admit that the differences in tone between the governments actions and the Presidents words are - to me - very interesting. to those with a much better grasp of Irish politics than me, who'se out of touch? Bear in mind that the Presidents role is very similar to that of the UKs monarchs. Its purely titular with no executive power. Some titular heads of state will be more vocal than others. I know it's difficult when looking at photos, but would I be right in saying that Eithne would be roughly the same size as this ship? Eh, no! more then twice as long and 10 times heavier! "This ship is close, this one is far far away." Probably have some little O/Sea with a red flag standing on the flight deck waving them off should the attempt to land. Memories of trying to fend off a VLCC with a hand portable fender the size of a football as ordered by a now serving commander, who was but a Subbie at the time! just burn off the cradle and turn the crane the other way for a temporary emergency deck.! I reckon the extra boat will get more work than helos, any way the Italians have enough to carry them down in those parts. If the DF had a helo type that was deployable, it might warrant some consideration, given we haven't and the fife of the ship will have expired before anyone considers it a worthwhile exercise ...pipe dream I'm afraid. 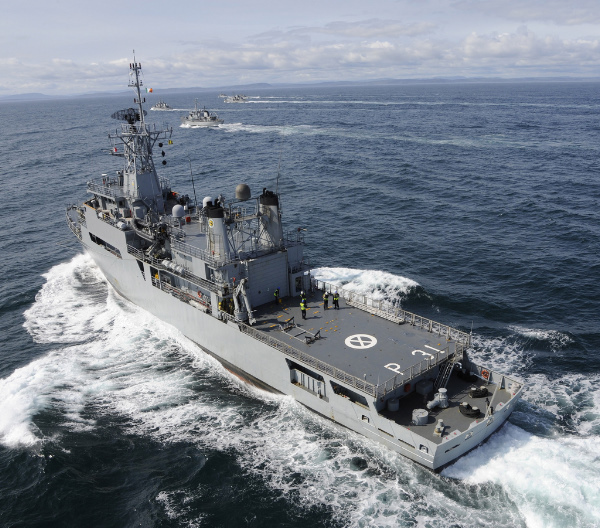 The concept of Eithne was an attempt to move the Navy forward to embrace modern technology in electronics, gunnery, and using Helicopters to extend capability at sea. It was initally proposed from the bottom up that the Navy would do it's own flying following British, and French training. Others took over the air capability question and demanded the vessel be brought to the highest NATO class 1 level for a single deck ship. After a period of integration , a rapid phase of attrition set in with helicopters dispersed by disposal to an aircraft refurbish-er who sold them on to the Government of Chile. Thereafter the ships capabilities were redacted in favor of other conveniences. Nothing much wrong with the ship but she will always be subject to decisions of those tasked to take the Navy forward. And did so gallantly except by choosing the wrong machine and then playing empires the AC were a primary player in the failure of the project. If the capabilty of the machine selected had been greater,the originally intention for eight machines followed and ownership of two of these passed over to the NS it would have been a good outcome, sewing the seeds for a Naval Aviation foundation into the future. Had the present been seen in the past and where technology evolved to the requirement for a ship based helo specifically for Fishery Protection would have been null and void given how much it cost. PWH tagged its as not being value for money and even when it did become operational it wasn't cost effective. That same shift in focus and lack of ambition beyond FP, whether political or otherwise is still evident today in the design of the P60 OPV class. They perform their constabulary role in the Irish EEZ to an extremely high degree of efficciency. But they have very limited potential to expand beyond that role and to act independently away from CASA top cover(and Im not talking about flag waving cruises). More´s the pity the ambitions of the 80´s were not expanded on in that. Personally I would have to say that I think that it´s wrong to state that a properly equipped capable NS owned helicopter would be anything short of an asset on the flight of LE Eithne, regardless of supposed limitations of operating it from an 85m vessel. To argue otherwise is in my opinion an attempt to justify the unjustifiable situation of having a RHIB and crane permanently occupying the flight deck of a Naval ship. Last edited by Jetjock; 8th May 2015 at 21:14. Lets be fair here. At the time it was built, it was the smallest possible ship you could build that could safely land a heli. 75m at the waterline, the experts at NEVESBU said. The concept itself was good. Extend the area the ship can patrol effectively by extending its over the horizon reach. Design: Helipad had a "well" aft, which was completely unnecessary, and in the unlikely event of an aircraft fire, would add to the risk of the fire getting caught astern. Was Sea Rider fuel stored here too? You could have extended the flight deck to the stern and potentially increased the size of aircraft that could operate here. Why did we make the helideck a few metres shorter than it needed to be? Even having the solid hangar was unnecessary. Given the amount of time it was expected that the heli would stay aboard, a telescopic hangar as used on the Knox and Bear class would have been more efficient. Indeed the fitout of the hangar and the flight crew accom was done based on the advice of the Air Corps, who had no experience whatsoever of heli-ops at sea. They got a fully kitted out workshop that they would never use, nor be able to use, even if they wanted to. The collapsible railings were also cumbersome, even dangerous for crew to drop. Concept: The ship went from being a force multiplier for the defence forces, to being a political football. Initially 2 ships of type were planned. Then its reason for existence was to keep Verolme dockyard open. The Dockyard did all sort of messing about which left us with a ship that was behind schedule and over budget by about 200%. Lots of equipment was fitted incorrectly, some fittings deliberately the wrong way about, to extend the duration the workforce would get to complete the ship (could be the same happening in appledore?). In the middle of the worst recession the country had seen since the foundation of the state, the 2nd ship was not ordered. This reduced the demonstration of the concept. If 2 identical HPVs were available for AC to train on, then maybe more time could have been spent getting crews familiar both in the NS and the AC. But one ship can't stay at sea all year round. Helicopter: Wrong from the start. Our neighbours on all sides were using the Lynx. (Even France) It is, and was a Naval Helicopter, i.e it is a flying naval weapon or sensor. Initial renderings of the HPV had a Lynx on deck. Round the same time the Army were jumping in and out of a leased Puma. It was ideal for what they needed it for i.e SAR and Moving troops about. At this time we had no 24 hour SAR Heli, and the Alouettes had limited range over water. Whats that got to do with the HPV I hear you ask? Well someone saw Aerospatiale, who had provided the AC with many happy years (and trips to Marseilles) flying with the Alouette and Gazelle, had a new 2 engined Helicopter to replace the A3 in service. It would also have a Naval version, armed with Missiles, and the USCG would be developing their own version with American built parts. They were using theirs for Short range SAR, and potentially operate them from the back of their HPV size cutters. The French were also offering the Dauphin as an army Helicopter... in the anti tank role... hey that ticks all the boxes right? Instead of buying 2 different types that are suited for purpose, why not go for a Prototype compromise? Sure it has never flown from a ship before, we can help the French with that, they can test it on ours! So it doesn't carry as many troops as a Puma or go as far, but its much better than an alouette, and if we put this radar in, we can fly it by night too! Ok so nobody else is using that radar either but what can go wrong? Oh, you want to use it for VIP transport too, so the poor citizen can see how well its great leader is respected when he is ferried to public events in an aircraft that should be doing SAR now? Oh and you want to base one of the 5 you bought on the west coast, away from the others, and the technicians? And you want to load it with so much kit that it cannot take off with a full fuel load and a full crew? That's gonna reduce the range somewhat! Oh and you won't let the pilots use the autoland because you don't trust it so instead they have to do their best with blind approaches in fog, that would lead to inevitable tragic results? And you are going to see it replaced in the SAR role with an aircraft that was being used by the UK for the SAR job before the Dauphin entered service? Its still a fine ship though. It was designed primarily as a warship. It has a warships ops room. It had some equipment that warships have as a matter of routine. (since removed). The real problem was we should have got a second ship. In our short naval history, our first of class has been a learning experience, and the 2nd of class has been an improvement on the 1st. Emer was an improvement on Deirdre. (Aoife was an improvement again on Emer) Niamh was an improvement on Roisin. Even today, the issues with Beckett are being ironed out on Joyce before it enters service. But it was the Last Irish Built ship, and always will be. It was the best we could do. One wonders would it be better if we had not decided to go it alone and build it in a country experienced in building ships of this type, assisted in design by those who had a long history of operating helicopters from small ships in atlantic conditions. Long answer: Yes, and gone for the Lynx effect. Some of what Grohmiti says may be near some of the truth. The ordering of EITHNE to the handover on the day the Dockyard shut down was April 1982 to first week in November 1984. There was no sense of impinging delay, rather that one side of Government pressure would see the Yard shut before the ship was fully completed. Two to three years for such a vessel is not extraordinary. The flight deck of above naval strength was designed principally for the helicopter of Aircorps choice, THE Dauphin 2. The hanger evolved around Aircorps requirements of a foam room to fully flood the hangar and an X/Y overhead crane system for engine change and blade removal-so fixed it was. The flight deck had a fully fire insulated drainage system under the Harpoon grid on a deck with upstands for blanket foaming. The flight deck maybe could have been extended aft, at some cost to rearrange maintenance of patrol trim and draft. In subsequent French Navy evaluations the deck environment was classified as beyond expectations. Their pilots eventually put the purchased Dauphin on board both Day and Night in all directions including facing aft in a tail wind. The vessel was fitted with day/night recovery aids including transponder from MEL. The cost around 26m including bits and pieces seemed at the time to be as expected. The only memory of misfitting is I,m afraid zero. Some alterations were made to suit operational convenience such as changing door swing or heights of access platforms to equipments. To be honest there was not a hope in hell that inter-service priorities would be shelved in order to let the project function. What happened was chastening and unexpected and not because the ship was wrong. With ships welding and burning can make adjustments but minds can be intransigent. Was Sea Rider fuel stored here too? It would be if we had a helo capable of operating from it for the past 20 years, dues to the lack of foresight with other branches of the DF, this did not prove to be the case. Cue the fresh water piping which was stainless steel instead of copper and had to be replaced by mid 1986, the searider cradles mounted back wards, resulting in the boats needing to be turned under way, and the cranes them selves being very prone to corrosion so much so the one mounted on the foc'sle needing removing in the first year alone, the flight deck guard rails make from box iron as opposed to aluminium....used to terrify me when lowering them, getting them back up a nightmare. A Mk 2 would have been perfection! Everything else is history or conjecture. Last edited by hptmurphy; 9th May 2015 at 16:19.